High temperature protected sensors and instruments for taking measurements of very hot liquid or gases. These devices are designed to withstand high temperature process media and incorporate very high temperature tolerant components or are combined with a cooling assembly to protect the heat sensitive part of device. Browse measurement instrumentation with built-in high temperature protection by product type. High Temperature Pressure Transmitters- High temperature pressure transmitters with a 4-20mA output, tolerant to high temperature applications such as steam, food processing & engine monitoring. 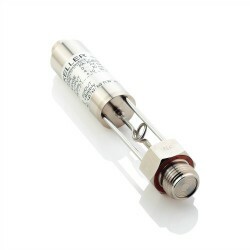 High Temperature Pressure Gauges- Pressure gauges for measuring high temperature fluids or gases. These high temperature pressure gauges are have or include optional extra design features to protect the pressure gauge from high temperature media. High Temperature Voltage Output Pressure Transducers- Measure the pressure of hot liquid or gases with a variable analog voltage output from a high temperature protected pressure transducer. Pressure sensors with cooling elements for isolating a high media temperature or where the whole device can be installed in a very hot environment. Liquid level sensors with cooling elements for isolating a high media temperature or where the whole device can be submerged in a hot fluid. Pressure gauges for use on very hot media with built in cooling features to isolate and protect the electronics and visual display. Send us your enquiry for a product associated with this High Temperature Protection page, and get assistance with selecting a product for your application.